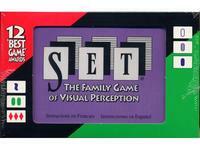 Each card contains 1-3 matching objects, in one of three colors, shapes, and shadings. Twelve cards are laid out, and the first person to spot a set of three collects those cards. The cards are replaced from the deck and play continues. A set consists of three cards which are either all alike or all different in each attribute: for instance, if all three cards have the same number of objects, but different shapes, shadings, and colors, then they're a set. If two of the cards have a common attribute that is not shared by the third, they are not a set.